Do you see that hat up there? The one with teapots on it? Jennifer from Pastry & Purls made it for me. I admired a similar one on her blog-after all, a hat with teapots is just calling out my name. In this case, I mean that literally since the pattern is the Tea Jenny. 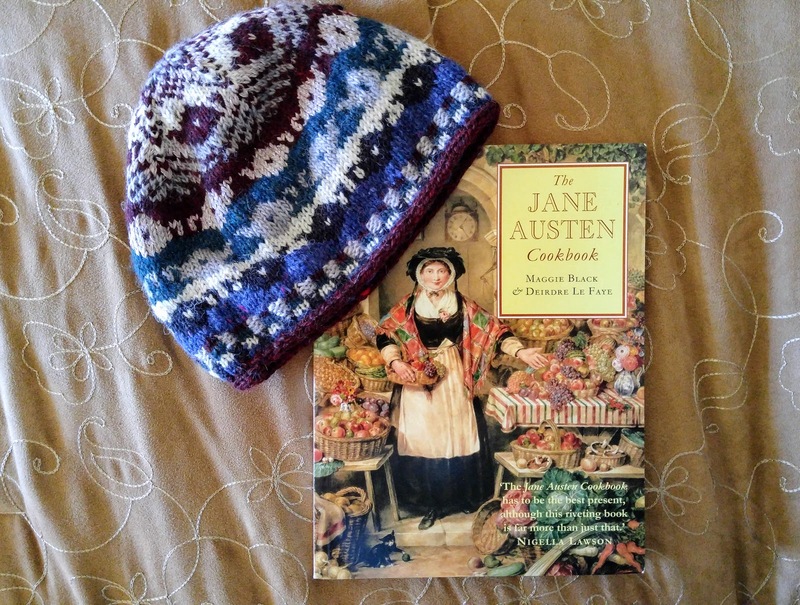 Jennifer contacted me and offered to knit me my own Tea Jenny hat. I was so touched by her kindness. It came in the mail last week and I love it. It makes me smile every time I see it. Jennifer also sent the book. Obviously, my interests are coming through clearly on my blog. I will shortly be an expert on how to make ratafia cakes and syllabub and beef-steak pudding. It is so interesting to see what actually goes into some of the foods that have been mentioned in the books I read. I am thinking I might need to make a whole dinner based around this cookbook. I told my dad about my blog. For the longest time, my kids and husband were the only ones in my real life who knew it existed. However, I knew my dad would get a kick out of it and I was right. He was flatteringly enthusiastic and promptly bought me a subscription to this magazine. He said he used to read it years ago. The first issue showed up in the mail recently and I am enjoying looking through it. This isn't a gift unless you consider it a gift to myself. I've mentioned my fascination with wartime diaries many times before. This book is new to me and I am finding it very interesting. 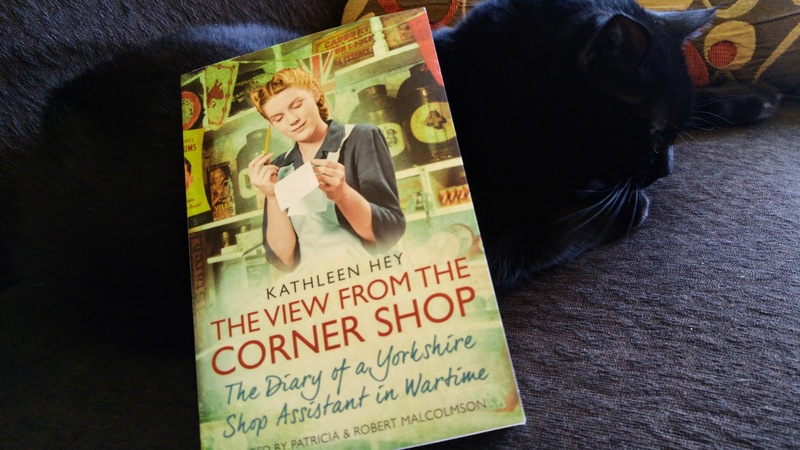 Since the diarist was a shop assistant there is a lot about the rationing scheme and how it worked and impacted shopkeepers. Kathleen Hey lived in an area that wasn't bombed but that did have to deal with evacuees and the day-to-day deprivations of wartime. I am about halfway through the book and would definitely recommend it. Now, if only this unseasonably warm weather will come to an end so I can wear my new hat. I do wish I'd managed to send it earlier. But my mom tells me there's still a chance of frost by her until the end of March, and you're much further north than she is. Fingers crossed there's a brief cold spell so you can break it in. :) That cookbook also really had your name all over it, and I couldn't resist. Your dad sounds really lovely. What a nice thing to do! The day it arrived it was warm out but the temperature promptly dropped. I am sure winter is not over, it is only March 1st. I'll have plenty of time to wear it. Thank you again! What a cute hat!!! I have that same Jane Austen cookbook, though I haven't tried anything from it yet. You keep making my TBR list longer and longer, I'll have you know. Adding "The View from the Corner Shop" to it. I used to get "The Writer" from my library, long ago. I also subscribed to "Writer's Digest" for a few years. I hope you enjoy and learn from yours! I am always happy to enable book buying! I am so tempted to actually make a Jane Austen meal. I think I will definitely try ratafia cakes. I have just always wondered about them. I'll have to look for Writer's Digest as well. If you subscribed for a few years you must have found it beneficial. 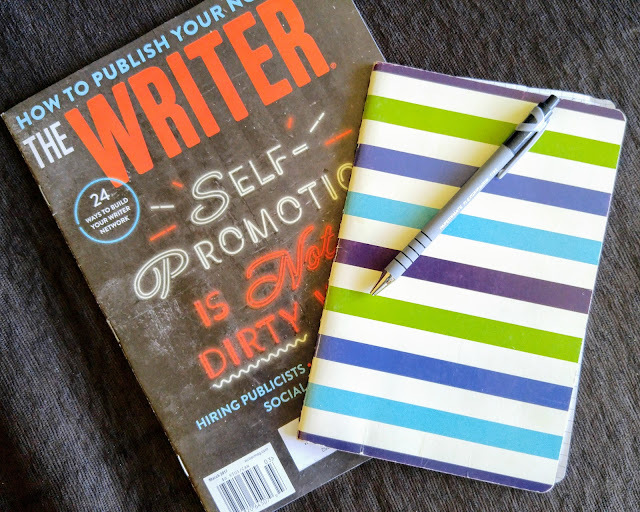 I really liked Writer's Digest. Your library might have it, if you want to try it out. I quit subscribing because I had a baby and much less writing time. Little gifts are so nice. They seem to be more sincere, personal and thought out then flashy bigger items. I agree that wartime diaries are often enlightening. They seem to tell us a lot about a society and people under stress. That is what I appreciate about little gifts. You know the person actually thought about you. I am not sure why I find the WWII diaries so enthralling but it is the little details I really like--what people ate and wore and thought. It fleshes out the picture so completely. I enjoyed your post. The diary looks interesting. I hope it's good. Thanks! I enjoyed the diary. It is fascinating to get such a window into the past. These are such thoughtful gifts! I really love giving gifts, trying to find the perfect thing for someone. 4 of my friends turned 30 in the past two weeks and I had a lot of fun picking out something little to get each of them. My husband always buys me books about writing and I think it's his way of showing me that he believes in me and wants me to succeed. It means the world to me and I have them all on my dresser. That is so sweet of your husband! I am impressed. It is the little things that really make you feel understood.